Brad Walker talks about ‘An Amazing Village in Thailand’. 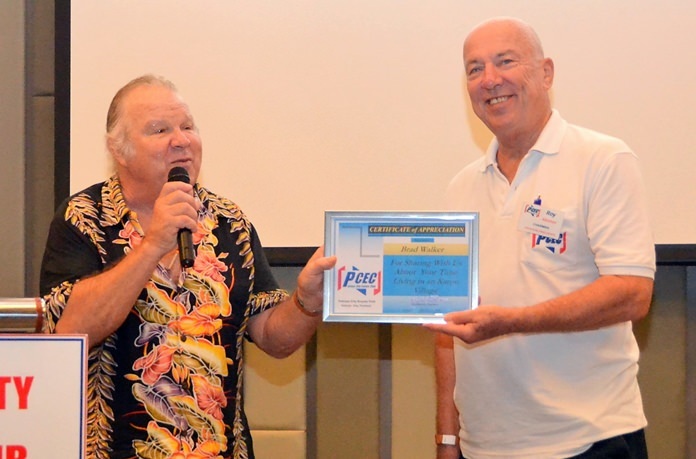 ‘An Amazing Village in Thailand’ was the topic for Brad Walker at the Sunday, January 7 meeting of the Pattaya City Expats Club. Brad is a self-proclaimed cowboy, hippie, student radical, impresario, airplane pilot, surfer, golfer, sailor, ship captain, radio reporter, garment designer and manufacturer, importer, seminar instructor, teacher, song writer and world traveler, just to name a few of his endeavors. But, it was his life experience of living in Thailand that led to his writing and publishing two books about it. Brad was born in Colorado, USA, and migrated to California at the age of 6 weeks. As he says, “I was born at a very early age and started out as a child.” Never admitting to actually having grown up, he sailed a boat to Hawaii in 1973 and lived there for the next 32 years, before relocating to Thailand. 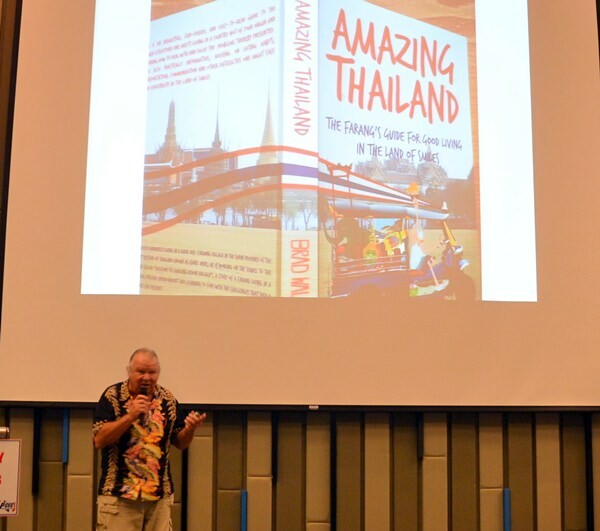 Brad previously spoke to the Club about his first book, “Amazing Thailand: The Farang’s Guide for Good Living in the Land of Smiles” which became the number 5 best seller at Asia Books. Brad tells the stories of what he has done and learned about living in a country not of your birth or background and many things you should know both before you make such a move and after you do. It includes both adventures and misadventures. Often humorous in the retelling of his experiences, it also offers practical advice on working, doing business, eating habits, transportation, communication, and other difficulties one might face as an expatriate in the Land of Smiles. Brad explained that he originally wrote a partial draft of his book about living in Kedon Village in Surin Province which he sent to Asia books to see if they would be interested in publishing it. They were, but they also asked if he had any other manuscripts, which caused him to send them his incomplete draft of his Amazing Thailand book. As a result, they decided they wanted him to finish writing his Amazing Thailand book and they would publish it. This he did, taking some of the chapters from his book about Kedon Village and incorporating them into his Amazing Thailand manuscript. Thus, Amazing Thailand became his first published book. He continued writing his book about living in a Kedon Village in Surin Province. When he finished it, he contacted Asia Books about publishing it. They stated they were no longer publishing books, but if he self-published, they would be happy to be the distributor. He did and they did. He then delighted listeners by speaking about his latest book, entitled “Welcome to Amazing Kedon Village – Who would be crazy enough?” The book recounts his 12 years of residing in the small rice farming village where he chose to live. MC Roy Albiston presents Brad Walker with the PCEC’s Certificate of Appreciation. But how did the village became to be known as Amazing? Well it happened over beer and friendship. A friend of his had stayed with him for four months and they decided that the village and people of Kedon were in fact amazing. 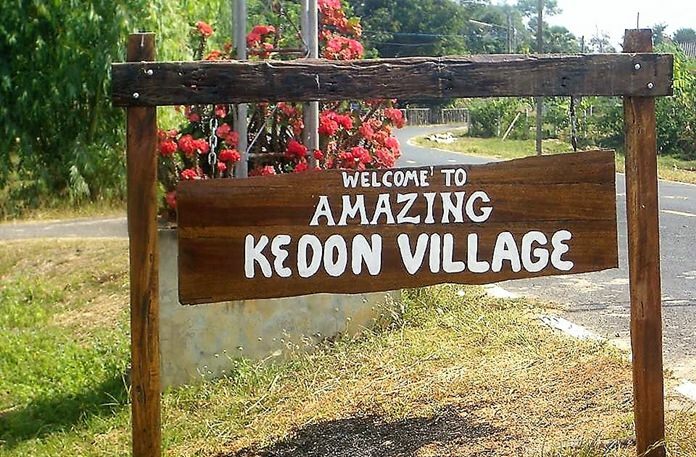 Brad recounted how he put up a sign in his village saying “Welcome to Amazing Kedon Village” a play on the “Amazing Thailand” theme of tourism promotions in Thailand. The sign was in English and was intended to be satirical. When the meaning was explained to a village elder, he loved the idea and proceeded to have a similar sign erected in Thai. The villagers moved Brad’s sign to an even better location. Brad said that when they had a ceremony to unveil the Thai sign, a lot of people wanted their photos taken next to the English sign. Brad told us about his funny experiences. Like many Farangs, he met and married a young Thai beauty and was persuaded to build a house and relocate to the village of her birth. Here the story diverges from the typical, in that the couple split up and he remained in the house, while she went away. The book traces events that ensued and how he adapted to living in a place wherein only Thai is spoken and the author’s command of that language, not to mention the lifestyle offered up, was minimal at best. While the book presents a humorous take on the events as they unfolded, it is loaded with both tales of village life and practical information about how to deal with the circumstances it presents. He delves into such topics as having to call a shaman in to banish ghosts to expel his mother-in-law’s fears. Seemingly, every house and building in Thailand has its guardian spirits to protect the place from evil. But, sometimes, ghosts do appear and one must have them placated so they go away. This is the sign that Brad Walker made and placed at the entrance of Kedon Village in Surin Province. Brad also mentioned that to pay back the village, he was very proud to announce that proceeds from the book will go towards a village scholarship fund to enable hardworking, wonderful children from the village to attend school, learn English and eventually attend university and succeed. 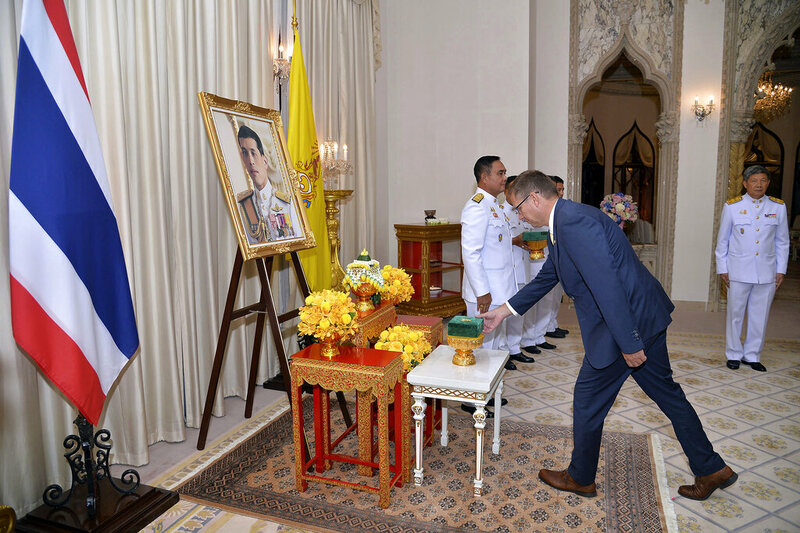 “Education is a way out for Thai people,” he explained. Asia Books are helping out in this endeavor. In conclusion, Brad asked Club Member Ren Lexander, who it turns out helped Brad in editing the book, to come up on stage. Together, they sang a hilarious rendition of his ‘Motorbike Song,’ which is included in his book. The lyrics are based on a Thai lady (Ren) asking their Farang (Brad) to buy them a motorbike. As the song continues, it progresses through requests to buy other things, such as gold and a house. After Brad answered several questions from the audience, MC Roy Albiston brought everyone up to date on upcoming events. This was followed by the “Open Forum” portion of the meeting, where questions are asked and answered and comments made about expat living in Thailand. For more information on the Club and their activities, visit www.pcec.club. The video of PCEC Member Ren Lexander interviewing author Brad Walker about his presentation can be found at https://www.youtube.com/watch?v=FvC8Cz1UvFA.